The holiday season is gearing up here in Boston, and we are fully stocked with wreaths of all shapes and sizes. We are bound to have the perfect accent for your doorway or outdoor display. For our full collection, be sure to click on "Seasonal Wreaths" under "Shop" in the navigation bar ahead! 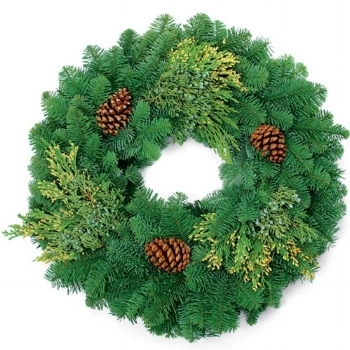 Mixed Evergreen: this fresh and simplistic evergreen wreath is accented with all the favorites of the season. Available in 18", 24", and 32" outside diameters. Fresh Bunches: this wreath filled with magnolia, evergreens, boxwoods creates a lush display of seasonal bounty! Available in 18", and 24" outside diameters. Pomegrantes & Bunches: this lush wreath made of evergreens and magnolia is completed by the classic reds of the season. Available in 18" outside diameter. Don't forget, today is Small Business Saturday! Be sure to come by and jump start your holiday season!